Alternative medicine is a big business resulting in billions of dollars of income per year in the US alone. By 2025, it is expected to be worth $197 billion according to a Grand View Research report. Alternative medicine is in no way a new venue or avenue to generate income from consumers. Charlatans have been peddling snake oil since the dawn of commerce. While the FDA, modern medicine, and other regulatory bodies have tried to expose alternative medicine for what it is, people still continue to gamble on snake oil and the like as a means to become more involved in their health care. In 2016, Americans spent $30.2 billion on alternative medicine. Of this amount, $1.9 billion was spent on children. Clearly pseudoscience is a big business. What is important to note is that this is also a reflection of a science literacy crisis within the US. These alternative medicine approaches are not bound to the strict rigor of peer review, government regulations, ethics boards, as well as multiple trials to show that a “treatment” is more effective than a placebo effect. There is a real danger of death among Americans with the sparkly “quick fix” and “what your doctor will not tell you” click bait titles luring people to have a distrust of modern medicine especially those who have the word “cancer” in their diagnosis. A recent study investigated cancer patients to determine their risk of death through the use of alternative therapies versus conventional medicine. The study examined patients with breast, prostate, lung, and colorectal cancers. The study focused on diagnoses from Jan. 1st, 2004 – Dec. 31st, 2013. The researchers measured overall outcome, survival, adherence to treatments, and patient characteristics. This study involved nearly 2 million people. What they found is that cancer patients who used alternative therapies were less likely to seek conventional medical therapies. This resulted in a 2-fold (twice as likely) increase risk of death for patients who engaged in alternative therapies versus patients who sought established medical treatment. Another smaller study focused on demographics of individuals with similar diagnoses to gauge outcome of those who chose alternative medicine over conventional medical treatments. This study had a 2:1 ratio of participants where ~560 sought conventional treatment versus ~ 280 for alternative. The patients who were women with diagnoses of breast cancer who chose alternative medicine were at a risk of death five times more than women who sought established medical treatments. Alternative medicine patients who suffered colorectal cancer had a four fold risk of death while those with lung cancer had a 2 fold risk of death than patients under medical doctor supervision. The overall findings show that patients who sought alternative medicine for cancer treatment over conventional medicine were more likely to die. Alternative medicine, while persisting at being a big business, is more likely to kill you than cure you. Alternative medicine is not bound to proof and scrutiny like conventional medicine. Conventional medicine is in no way perfect, but it is a far better option than spending money towards an assured steady and rapid decline towards death. Conventional medical treatments for cancer are not shiny, bedazzled, click baity, and a “quick fix”. They are often brutal, rigorous, scary looking, and not guaranteed. Alternative medicine is not guaranteed either. However, your chances of survival increase with proven medical treatments over the snake oil peddlers who make substantial amounts of money ushering you swiftly to your death. Alternative medicine peddles false hope and in many ways preys upon the most vulnerable. 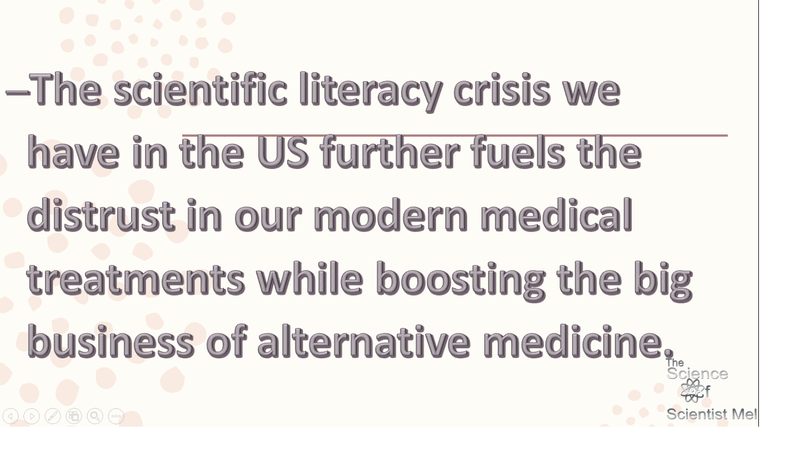 The scientific literacy crisis we have in the US further fuels the distrust in our modern medical treatments while boosting the big business of alternative medicine. The best defense is staying educated and aware of current discovery. Want to know how to spot pseudoscience? Check out my episode of #TheScienceOf Pseudoscience and call the bluff on alternative medicine! Stay passionately curious and come learn with me.